Sometimes I imagine I am writing a column that will be read by thousands of women. I read a few articles in the new Chatelaine magazine which focus on mothering, natch because it's Mother's Day in May. It makes me feel like I would love to find that kind of knowledgeable yet slightly snarky voice some of the women have. Particularly one article about the dark side of mothering. First time in a national magazine that I have read something dealing so honestly with a mother's inadequacies - she admits that she felt she was losing it, describes how she locked herself in the bathroom so she would not harm her two little daughters, one of whom was screaming and banging on the locked door. I think she actually left the marriage and the children temporarily. I rarely felt it that extremely, but there were definitely times (still are? but rarer) when the screaming ogre, the PMS monster, the mommy-from-hell is at the helm ranting and losing it. When they were really little, I remember trying to meditate one Saturday morning, while little fists banged on the door, crying to come in; and silly me expecting my husband to pick up the slack since it was 'his turn' to care for the kids that morning. Wouldn't it be wonderful to have a mask you could put on and take off, the Mommy Monster Mask, and after you acted out your frustration with the mask on you could take it off and reassure everybody that it was all just a play, not for real, that nobody would get hurt. Unfortunately, I think the tiny humans in the house would still run for cover and be extremely afraid. So harried and harassed moms and dads, please heed the shrill breaking of your nerves and get help! there are herbal remedies, there are breathing exercises, even just going for a run may help you get back on track. Don't neglect yourselves. Mother yourself, baby yourself with little kindnesses regularly. Keep the stress level down - I'm telling myself this, obviously, because when I am stressed my teens start snarling back at me and we all get out of whack. Why am I so hard-headed? It's taken me this long (and I need reminding) to realize that my energy can shift, and then their energy shifts, and we're happy again. Sigh, parenting is not about perfection, nor about 'getting it right'. It's about learning. It's about self-acceptance, the darkness and the light. Knock my head on the wall again to find out it hurts. Oh yeah, and naps are a really good way to change the energy to softness, for me. I'm going away to a conference for 5 days, but will write when I get back. I had no idea going into the workshop what would be in store for me. I thought it would entail ritual drama, some mythology, I don't know what. But it created such a deep sense of safety and peace in me, to be able to focus on my women's work, the writing I do about menopause, birthing, menstruation. To feel this is important and acceptable in a deep nurturing way. 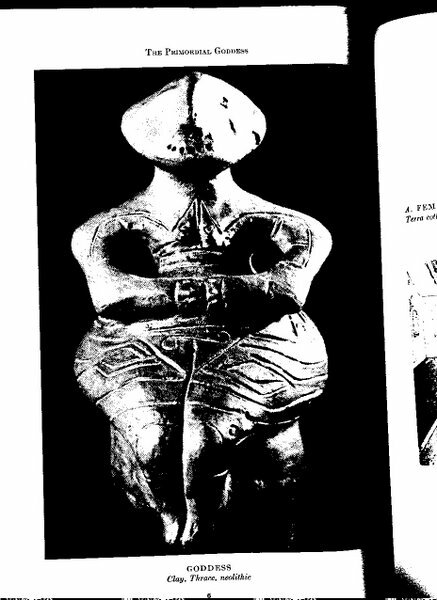 I even brought in some art work of my sister's, and shared that with the circle, a big etching called Goddess Rising, with a woman asleep bent over her body, and a Venus of Willendorf, and a Greek statuette of a faceless woman with delta triangle etched in. The stone we were asked to bring is one my sister found in England or Scotland, shaped like the top half of one of those round bulbous Venus's with a birdlike head. We talked about our childhood, our sexuality, our lack of initiation, the need for initiation into women's rites, the monthly moon cycle we didn't celebrate. But it was simple, grounded in our own experience, nothing too esoterical which is what I feared I think. Somehow it has to be brought into the mainstream, the sound connection, solid real tangible connection of our bodies to the earth, of our inner spirit and our foremother's struggle; somehow I want to celebrate their strength, not bemoan their weaknesses. I want to find a place to meet, greet, and retreat with other women who long for this kind of communication, rest, rebirth into our authentic selves. The soul, some say, is the feminine essence. I don't assign a gender label to it, even in the Jungian sense of feminine - but it is the soft power, the ageless child within, the well of peace and understanding. Touch a person's soul, and you fall into the infinite wonder. Have a peaceful wonderful day, let your soul speak to you in metaphor, sunbeams, music. 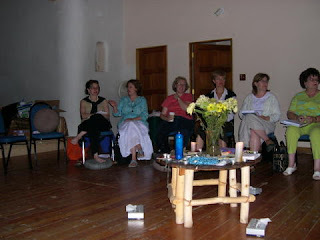 I was in a wonderful 'awakening feminine energies' workshop so missed posting this for Earth Day. One day late, here it is, a poem that was read aloud to a gathering on Earth Day a few years ago, in Angell Woods. tucked in, no wild or wet to blow in. a marshy bog, or labyrinth for dogs. at its root, let cool air ripple your hair. Their casual loss is our casualty. Now that the whole world is going green, and we are no longer just 'tree huggers' advocating caring for the planet, our earth mother, let us watch the tight buds unfurl with wonder, and praise the songbirds that make the trees their home and bring us such delight. April is Poetry Month. I have a great book of poems that any poetry lover should own: Good Poems, selected by Garrison Kellor of national radio fame. So as you walk outside today, perhaps to work or walking the dog or just going to the mail box to mail a letter, let the Hereness and Nowness of where you are be with you. Today there is sunshine after stormy weather in Montreal. Hearts are glad about this! I am still lost sometimes in the forest of childhood, but an etching by my sister Sue of a shadowy girl leaving the forest and the house on the hill reminds me that I can move on, not stay stuck in that sadness of being lost. Today, I am trying to stay still, not rush, not panic with the busyness my list of things to do causes. I find stillness in the smallest places, doing laundry, cutting onions, making tea. Listen, the world is singing in your ear, the way home. my shiny stats counter shows me I have many people browsing, reading, sneaking a peek at this blog, and so Thank You! I am a bit in shock and awe today at the vagaries of Mother Nature - here in Montreal, a week after Easter, snow and sleet and cold. Not too unusual in early April, but after a week in hot tropical Panama, Central America, it's a huge contrast. This morning I felt so grateful to have an oasis within to turn to for comfort. One look outside, a cup of coffee and toast, then back upstairs to my duvet and a peaceful, deep, nourishing hour of sitting with my core, in silence. This practice just gets better I tell you, and it is not only available to yoginis and mystics. It's a practical practice, and it lets me join my rhythm of life within, where a celebration of life is always happening. See link to wordsofpeace.com for information. Just got a flyer from Kripalu, my favourite yoga retreat place in the Berkshires, and got dizzy reading all the workshops offered. I notice most of them offer "shortcuts" and "breakthroughs" to the "full potential" and improved consciousness of bliss. An avid workshop goer, I love reading the descriptions, and most of them tempt me, but the truth is, once you are back home with yourself, it's up to you and you alone to find the source of (whatever it is you think it is called) within. What I love about the inner wisdom I am learning is that it has no dogma, no dharma practices, no rituals, no rules, no chanting, no asanas, no fasting, no pujas. It is the inner puja of the soul, the harnessing of the mind to the heart, a simple but deep exploration in silence of the wonder of You. Fresh, beautiful, changing every day yet always the same. The true Tao, it is said cannot be described, only felt. Ah, yes, feeling - the only gateway to your self! Ok enough about the Inner Gate to Wisdom. I am taking a workshop this weekend called Awakening Feminine energies, here in Montreal at the NHC Institute. Can't wait to find out what that is all about, cause one day I want to turn around and share what I have learned. Dear wonderful women who are seeking shortcuts: one thing I do know is that it starts by listening to your body. In the pool in Panama, my friend Sylvie and I talked about our cycles, and how neat it is to know that you are in an up-swing cycle or a down-beat cycle - just like the moon who is shrinking from fullness right now I think, into the dark phase soon, then waxing from new moon into full moon again. We don't have to shine full on 100 watt bright all the time. Isn't that a relief? There is a cycle even after menopause, and that surprised me! My energy still comes and goes in waves. Ok so the one that really pulls me at Kripalu, just so you know, is called Sacred Passages, with medicine woman Marcela Lobos, to experience women's rites of passage the way our mothers could not teach us. Sounds awesome! This is the last year both kids will be in the same school and have holidays at Easter so we are headed to Panama with another family, to enjoy beach and tropical jungle and maybe glimpse the canal. But what I really want to tell you about is a book I've just picked up again, you know, the one on the shelf that just jumps out at you and says, read me! It's called The Woman's Belly Book. (I'm not good at putting links, but you can find it on Amazon or Indigo I'm sure). I opened it up to the page, Enhance your Intuition - 'trust your gut'. Very timely because of all the changes coming up: a possible move, major renovations that would entail, causing that jiggly feeling of fear in the belly. But sometimes you have to move on through that. If I focus my awareness in my belly as I'm considering my options, my belly tenses up as I think of one choice and relaxes as I think of another. (I picture that house, that view, then I picture staying put and ... hmmm, not clear). When I'm writing in my journal about an issue that's been troubling me and come to a resolution, my belly rumbles, affirming my insight out loud!" (I'll have to try that one). A magazine, Sagewoman, that I picked up this afternoon while rummaging for inspiration, had its whole issue based on grounding and centering. I took that as a clue to what I need today. This week has been scattered, almost dangerously so. I left the house on Monday to buy running shoes with my son, and when we got back an hour later, the kitchen was smokey, the alarm was beeping, and the dog was in a panic. I had left beets boiling on a back burner, and forgot to turn it off. That's a feeling I don't want to repeat ever! Then I rushed out to a choir evening, but first, a quick visit to the possible dream house. The alarm was shrieking over there, too! wrong code input. Forgot to put summer tires in the car for the garage appointment next morning (had to push forward another appointment the next day to drive in the tires). Booked Caitie a massage for after school, but her dance class was 2 hours long that afternoon; my cell phone battery was dead so she couldn't let me know; I drove there and back without finding her, assuming she'd taken the bus home. Luckily J had come home early and drove twenty minutes back to get her. Then to her massage, where she fell asleep, poor darling. I cooked supper at least while he was gone, and was done in time to take Caitie to see the homeopath at 7:30! ...what a day...I think I need a massage after this crazy week. Sigh, anyway, you know how it goes. There are some weeks like that. Today was a blessed day of rest, relatively speaking. Only a few little duties, phone calls and documents came my way. I did some yoga, mused and read, wrote and rested.